Oxime formation from hydroxylamine and ketone. Part 2: Elimination. The first decision is to decide which atom of the hydroxylamine acts as the nucleophile. Reaction 1 shows the oxygen and reaction 2 the nitrogen. The text books will tell you that nitrogen nucleophiles are better than oxygen ones. This is because nitrogen is less electronegative than oxygen (it has a smaller nuclear charge) and so binds its single lone pair less tightly than oxygen does its two lone pairs. Sometimes the Klopman-Salem equation is invoked, which tells you that the reactivity is directly proportional to the overlap between the donor MO and the (empty) acceptor MO, and inversely proportional to the energy gap between these two orbitals. Nitrogen wins out because its lone pair is “larger” and hence overlaps better, and because its donor MO energy is higher than oxygen and hence the energy gap between it and the π* C=O acceptor is lower. Reality check: We need to construct a suitable transition state for both possibilities, and then compare their free energies. There is a choice of choosing a stepwise pathway (the one shown in all the text books) in which the bond from N or O to C is formed in an initial step, and then followed by a step often just labelled PT to transfer the proton using solvent molecules. These two steps can also be conflated into a single concerted mechanism involving a 6-membered ring transition state. Quantum mechanically, this latter option has the advantage of avoiding any great build up of charge separation at any stage in the mechanism, but has the disadvantage that the entropic loss at the transition state is greater (although “borrowing” a water molecule from a bulk solvent for this purpose is easier than doing so from an infinite distance away). Shown below is a ωB97XD/6-311G(d,p)/SCRF=water calculation of the transition state for N-attack. It has a dipole moment of 6.2D, which is really quite small, and far from that expected for the zwitterionic intermediate shown in the stepwise mechanism (that would be between 15-30D). Cyclic transition state for N-attack. Click for animation of transition mode. The intrinsic reaction coordinate shows a concerted reaction with quite a small barrier. It is small because the nitrogen is in fact a super-nucleophile, its nucleophilicity has been augmented over that of a simple amine by a so-called α-effect from the adjacent two pairs of lone pairs on the oxygen activating the nitrogen lone pair by lone-pair repulsions. The gradient norm along the coordinate also shows an almost synchronous reaction. The only blip occurs at around IRC +1.3, and this corresponds to the transfer of a proton from NH to a water molecule. An earlier proton transfer from water to the carbonyl oxygen was essentially synchronous with formation of the N-C bond. This synchronicity is what helps avoid any large build up of charge separation. For this reason, I cannot help but feel that the text books could absorb this lesson and show a cyclic concerted reaction mechanism as a probable alternative to two stepwise processes. Next, O-attack. The IRC for this isomeric mode shows a significantly higher barrier compared to N (the computed relative free energies show the O to be higher by 8.3 kcal/mol than the N) and smaller exothermicity. It reveals even greater synchrony of the two proton transfers with the O-C bond formation. So we have a reality check of the text-books on this point in the form of an energy difference, which is always useful. O-attack. Click for animation of reaction mode. Now that our proton transfers are involved in the mechanism, it is time to take a closer look at the geometry of these transfers. On this point, the text books tell us that the most favourable geometry for a proton transfer is having the proton co-linear with the two oxygens. Whilst this is largely true for the geometries shown above, the resulting 6-membered ring as a result adopts a triangular shape, which is not ideal for the bond angles. This could be solved by incorporating a second water molecule, to give us model 3 shown above. A second water molecule can be placed in two alternative positions. The first simply solvates the 6-ring transition state. The second actively participates via an enlarged 8-membered ring transition state. 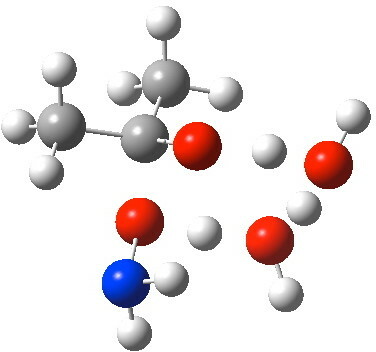 It turns out that the latter is lower by 4.5 kcal/mol in free energy, largely due to the far better bond angles and the almost exactly linear proton transfers now possible. 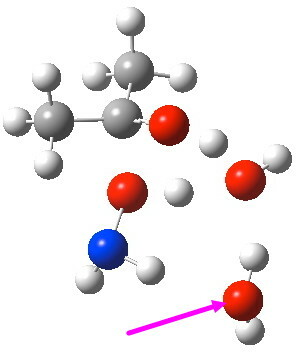 O-Transition state with two water molecules, one merely hydrogen bonding to the 6-ring (magenta arrow). O-Transition state with two water molecules, both part of a cyclic transition state. So the following is our best model. It is 10.4 kcal/mol lower in free energy than the isomeric O-attack transition state. The timing of the bonds shows that N-C formation coincides with the first proton transfer to the carbonyl oxygen, followed by an O to O proton transfer and finally N to O. The dipole moment at the transition state is 5.9D, revealing little explicit charge separation. N-attack via an 8-ring transition state. Click to view animation of reaction mode. It is worth concluding this exploration by reiterating that the models above are not complete. A bulk solvent would allow (statistical) participation of more than just two solvent molecules, and the dynamics of such a (very complex) process has yet to be explored. But I hope what you see here is a bit closer to “reality” than many a text-book author has when they illustrate their books. This entry was posted on Sunday, September 23rd, 2012 at 12:18 pm and is filed under Interesting chemistry. You can follow any responses to this entry through the RSS 2.0 feed. You can leave a response, or trackback from your own site.